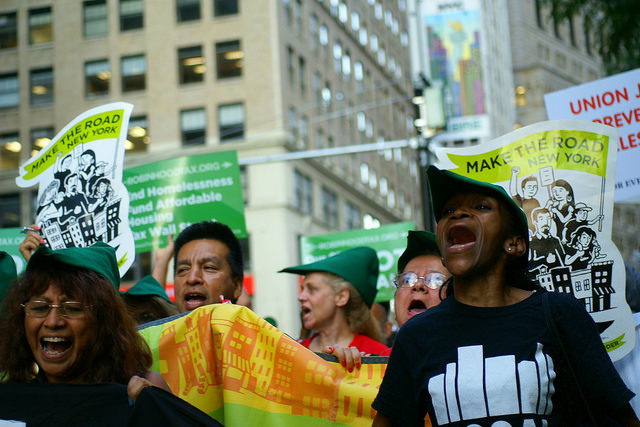 In New York City, protestors supporting the 4-week-old movement known as Occupy Wall Street have staged student walkouts, marched in solidarity with varying trade unions, and welcomed an array of high-profile guests. 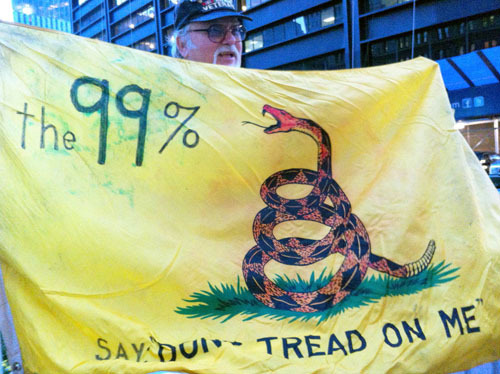 But Occupy Philly, which began four days ago in City Hall’s west plaza to try and replicate the scene in Manhattan’s Zuccotti Park, is still trying to find its sea legs. “It’s definitely been a process,” said Walbert Young. Sitting at a table beneath the imposing shadow of City Hall, the 26-year-old Young, of Wayne, Pa., said that there have been positives and negatives about the initial days of the occupation. 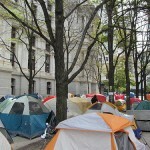 On the one hand, as is the case at Occupy Wall Street, a variety of volunteer-staffed committees have been established to cover basic living concerns such as food distribution, blanket and tarp distribution, sanitation and security, and new committees are “popping up every day,” he said. In addition, the city has supported the movement so far. Mayor Michael Nutter and police commissioner Charles Ramsey have both visited the site. There have been no incidents between protestors and police. Most importantly, Young said, the number of people visiting the site has steadily increased. At last count there were 96 tents set up at the site – up from 51 two days ago – and he estimated that there have been several hundred people milling around the occupation each of the past few days. “The numbers are definitely growing,” he said. But on the other hand, the occupation’s organization has been “evoloving,” Young said with a sheepish grin, and some protestors are wary about how the movement has progressed in its first few days. “I’m seriously concerned for these people,” said Chris Garvey, a 37-year-old Philadelphia resident. Garvey tried to raise an issue during the general assembly, the twice daily meeting where all protestors can discuss any number of topics related to the occupation, but he stopped talking out of frustration with “the people’s mic,” a tactic that calls for the speaker to speak in short cadences that are repeated by the rest of the meeting’s attendees. He said that he supports the idea of Occupy Philly, but he’s worried that a lack of structure will hamper the movement. Michael Miller of Juniata Park in Northeast Philadelphia, said that the number of beliefs and ideas among protestors was astounding. “I’ve been hearing (about) so many issues,” he said, noting that he’s discussed issues from political unity to financial reform with fellow protestors. But the jovial 35-year-old wondered whether the diversity of thought was helpful to the movement’s cause. 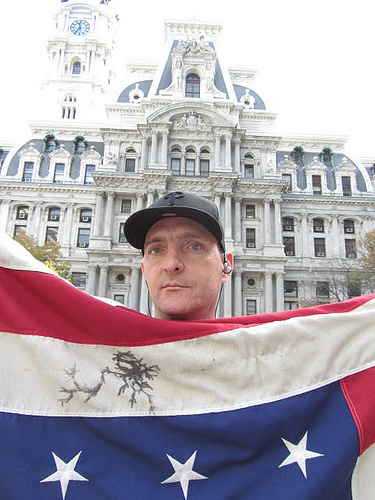 Young noted that there have been major disagreements about a variety of questions at Occupy Philly already, including whether the movement should apply for a permit (it did), and he said that there is a small but vocal minority of people with “fringe beliefs” who tend to be rabble rousers, rather than major contributors to the occupation. But for some protestors, the expression of diverse opinions is exactly what makes this movement so unique. “We all have our own opinions and reasons why we’re here,” said George Webb, 39, from Mayfair, in Northeast Philadelphia. Despite the early challenges facing the occupation, protestors were united in their desire to see the movement succeed. 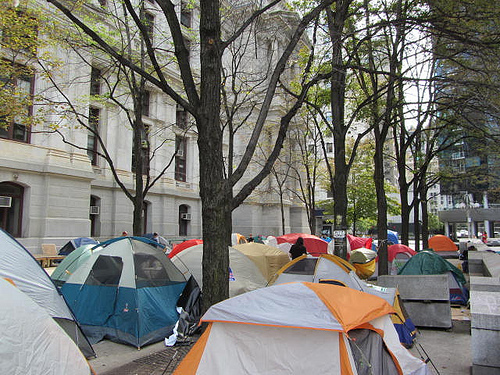 “I hope this movement stands strong,” said Miller, noting that Occupy Philly has only existed for a few days. “I’m willing to die in a tent,” he said with a laugh. And Young, who said the passion of the protestors has been encouraging, expects that the movement will continue to evolve over time. “Nothing happens overnight,” he said.